Without a fully automated system in place, it's not possible to verify that every single receipt matches up with all the expense items on a report. Typically, accountants will conduct a random audit on 30 or 40 percent of receipts. But why waste your time when Certify can do this for you automatically? Receipts are individually linked to each expense item, which employees, managers and accountants review during the submission and approval process. Certify catches compliance issues early, before they become problems that materialize during an audit. Accounting controls and tools abound in Certify, streamlining the accounting team’s workflow so they can focus on managing the exceptions to policy. If your corporate process requires receipt auditing, rest assured that you will find the task much simpler using Certify. Executives like this feature of Certify. If they suspect fraud in a particular business unit or even a specific employee, they can search for all flags automatically created by the system or added by managers. They also feel better when the auditors come, since finance can create an audit report of random files from any timeframe and export it to an Excel file. Certify offers proof that the company is complying with and enforcing responsible policies, since the system integrates the expense reporting process with those controls. 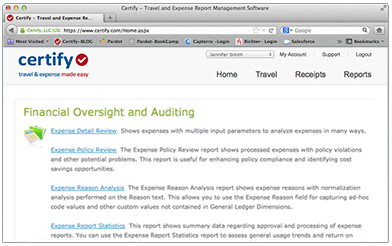 Certify is making auditing easier, without cutting corners. We think you'll like the precision and automation you will gain.